Netherley L27 Steam & Dry Carpet & Rug Cleaning Services | Quality Property Care Ltd. Restore your beautiful rugs with the help of a professional rug and carpet cleaning company in Netherley L27 Has your gorgeous rug lost its vivid colours and appears to be worn and dull? There easy and quick solution for you. Quality Property Care Ltd., a rug and carpet cleaning company which delivers high-quality residential and commercial carpet and rug cleaning in Netherley L27 and the region. The carpet and rug cleaning services are provided with the latest cleaning technologies and reliable cleaning solutions. The professional carpet and rug cleaning team provides carpet stain and spot removal, dry foam carpet cleaning or shampoo carpet cleaning for all types of rugs and carpets . Trust the trained and vetted cleaners to provide you top quality services at the best carpet and rug cleaning prices in the region. Call the expert client service line or send an online request for a 100 % free quote, and you will get an offer within 2 hours! The most effective deep cleaning for carpets and rugs is the wet deep carpet cleaning or the hot water extraction carpet cleaning from Quality Property Care Ltd.. It includes pre-treatment of the carpet by hoovering with professional vacuum cleaners, and then carpet stain and spot removal, followed by the steam carpet cleaning. The qualified cleaners perform a high quality shampoo carpet cleaning, using certified and safe cleaning methods, which will not cause harm to you, your children or your pets. The rug or carpet will have as much of the water extracted from it, so it will require only 2 hours to completely dry off. If you request it, the cleaners can perform a very nice deodorising of your carpets and rugs for an added clean and fresh effect. 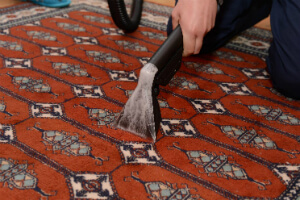 There are some rugs and carpets that cannot safely be cleaned with water, so the cleaners will provide a very efficient and safe dry foam carpet cleaning. The special and perfectly safe foam is sprayed and rubbed into the rug or carpet, and after it has done its cleaning job, it is extracted with the suitable tools and vacuum cleaners. The same can be done with your curtains, mattresses or blinds and draperies. Dry carpet cleaning requires no drying time, so you can step on your carpet or rug right after the cleaners are done. The first thing you need to do to minimize the stain reach and the potential damage, is to blot out the stain with a piece of cloth or paper. From edges in blot out the stain and check the paper or cloth to see if it’s transferring. This will draw out most of the stain and leave just a small quantity for us to remove which make our job easier and your carpet’s chances a lot higher. Once we get there we examine the rug and determine which cleaning agent will do the job. The carpet is cleaned with a hoover to remove any debris and prepare the fabric for cleaning. Once hoovered we implement the detergent on the spot and let it stay for a while so it can respond with the stain and help lift it up from the fabric. To remove it all we use a slim nozzle and our powerful hot water extractor which blasts the spot with a hot steam jet while at the same time drawing all of the gunk and filth, as well as water, out with a strong vacuum. Nothing of the stain and detergent is left, with only about 5% of the moisture used to clean left to evaporate the natural way. 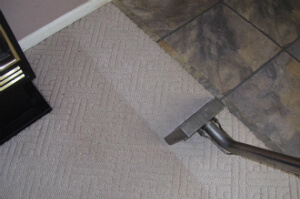 Based on the day and thickness of your carpet, the process should take anywhere between 3-4 hours. There are many different rug and carpet kinds out there and we’ve made sure to be able to clean them all effectively. Our professionals use a different technique for all different kinds, which allows us to safely and properly clean both synthetic and natural fibres. We can clean synthetic, wool, cotton, linen, organic fiber, viscose, silk, suede, plush, chenille, nubuck, leather, acrylic. With years we’ve managed to refine our stain removal procedures to a science allowing us to eliminate not only oily stains, paint, rust, blood, tea, wine, coffee, vomit, and moth damage, but also deal with synthetic and organic and synthetic stains. Book anytime by calling 0151 673 0008 or submitting a booking form on our web site. Get in touch with us with no hidden fees and any commitments.